Perfect treat for Father’s Day- I’ve just picked 4 quarts of organic strawberries at McEnroe’s Farm up in Amenia, NY. Tough picking because they’ve let the weeds grow up- so there were thistles to wrestle with (ouch) and slim pickings because this is only their first week of picking. So I was a bit early. Hope my dear friend, T, will go with me later in the week or even next week. No matter, I’ve frozen 3 quarts (for sorbet and the winter) and will use the rest for shortcake topping and for snacking. They are very sweet! 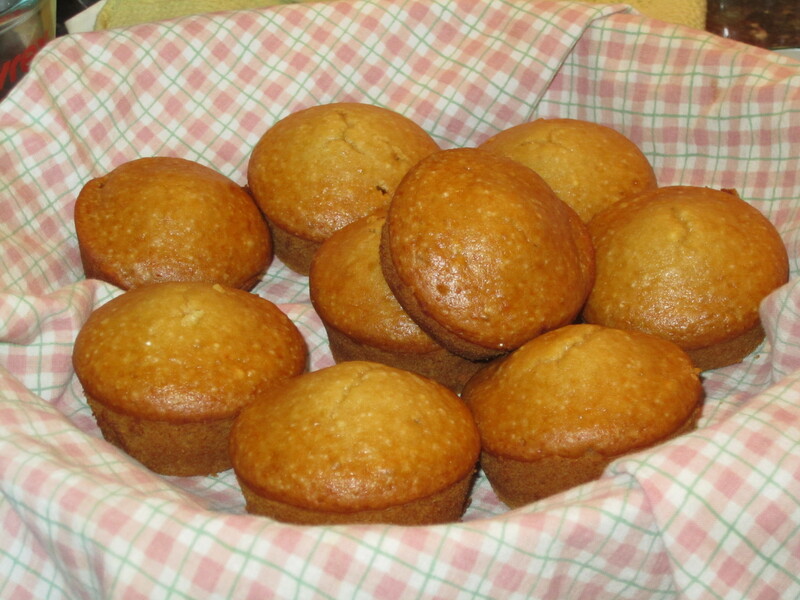 I have tried a new vanilla muffin recipe from food.com. It only makes 9 (really, I tried to stretch it but 9 it is) muffins/cupcakes so you might like to make more, these are going to go fast in my house. I also used a gluten free flour mix instead of all the separate flours. 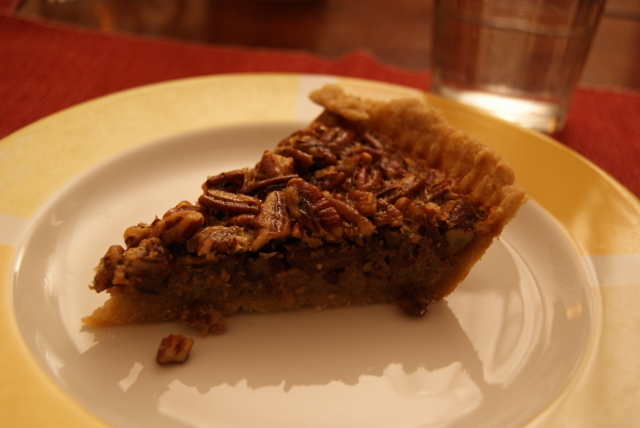 22 minutes in the oven was perfect time. The recipe also has chocolate frosting. I am not going to make that. 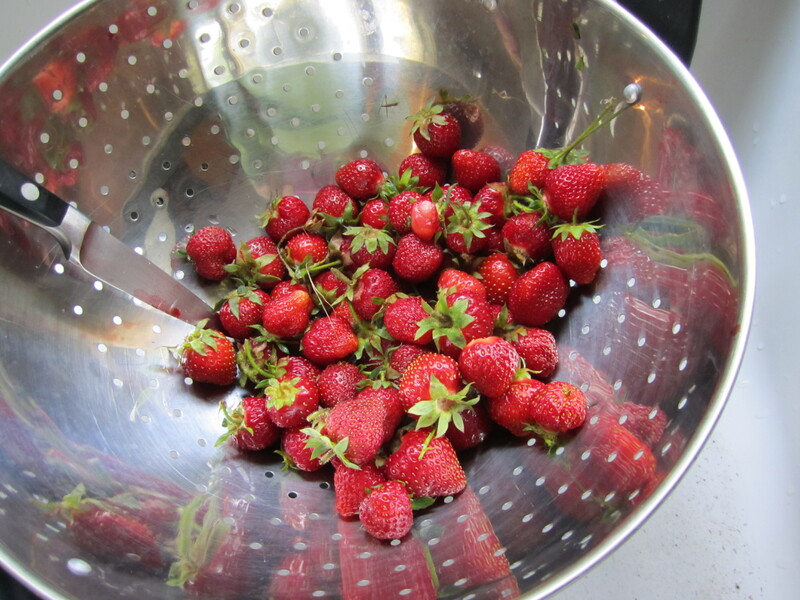 I will make strawberry topping, see below. Line muffin pan with 9 Liners and fill 3 remaining muffin cups with a little bit of water. Mix together soy milk, canola oil, vanilla and almond extract and agave nectar. Add flour, baking powder, baking soda, and salt one by one and mix for 1-2 minutes. Mixture will be thin. Fill 9 muffin cups approximately 2/3 full. Bake for 20 to 22 minutes until toothpick inserted into center of cupcake comes out clean. Let cool in pan for 1 hour to allow agave to set. Garnish with fresh berries and whipped tofu cream topping (1/2 cake organic tofu, 2 T tahini, 1 T agave syrup (or to desired sweetness) , pinch salt, 2 T grapeseed oil blend until smooth and creamy. My dear friend, T, invited me over for a fish taco dinner party on Sunday night. I asked if I could bring something and she requested Pico de gallo. I don’t know what it is, even- but gather that it’s what I call salsa and it goes on the fish. 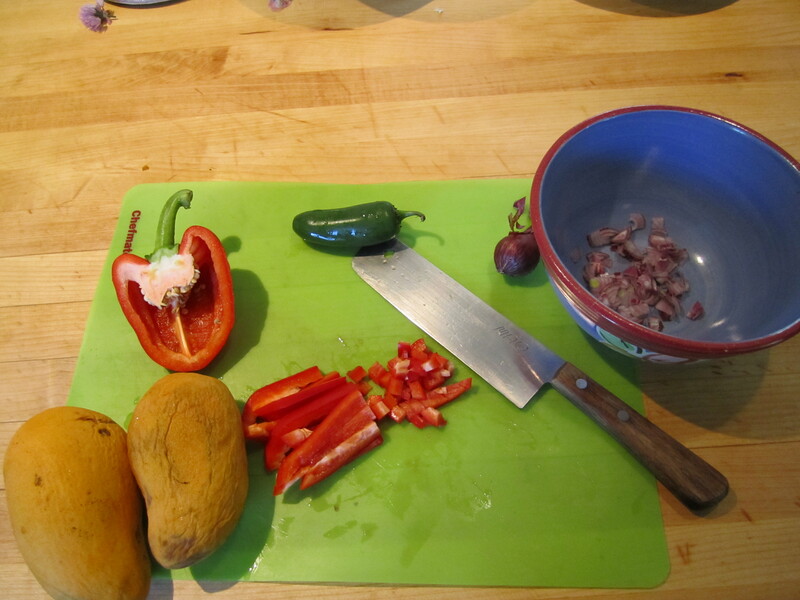 Pico de gallo in Spanish means rooster’s beak–whatever–and can be made as a fruit salad with chili and other spices sprinkled on the top, or as a raw condiment like a chutney made with vegetables. In the US we think of salsa as a chutney of diced tomatoes, maybe avocado, peppers, definitely a spicy jalapeno, lime juice, salt and often my unfavorite green, cilantro, sprinkled in so I cannot pick it out. I’ve had salsa made from peaches and also mangos as well as watermelon! I decided to be creative and make it up. 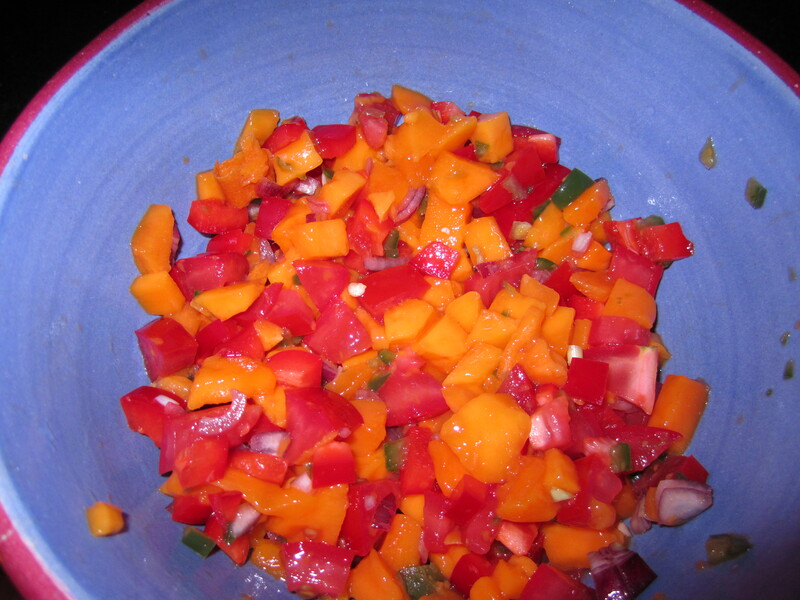 I had a few very ripe mangos on hand, went down to the store and bought 1 plum tomato, 1 red pepper and a green jalapeno, 1 lime. I also had a few little red onions left from last year and lots of fresh parsley in my garden, so I set about to make up a simple but yummy Pico de Gallo for our fish tacos. I garnished with chive flowers (you can see on at the top of photo, above) I broke up a few flowers and sprinkled in the salsa, too. It was very yummy. The dinner also included watermelon gazpacho, fresh picked garden salad with oil and salt dressing, sweet and spicy beans and rice, guacamole (with the dreaded cilantro), spicy tilapia, rice and corn tacos, my Pico de G and T’s special gluten-free banana cake. Delish. Here it is before the parsley was added. Still beautiful! I am up to my ears with information about chemicals in shampoos. You need a degree in chemistry to even read the ingredients let alone understand the list. Not only the ingredients, there is the plastic bottle quandary, too. BUT, wait a minute, shampoo is soap. There are natural soap companies all over. Soap making is an leasy local business. You can use a shampoo bar and that is just what I’ve been doing. 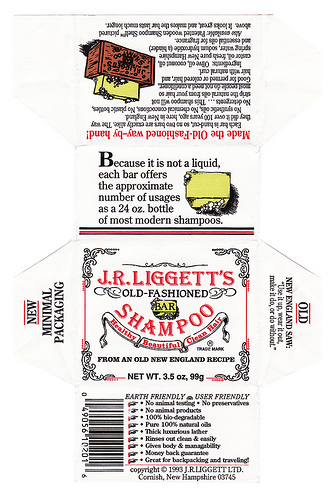 So, unbeknownst to my bestest friend, T, I have quietly become a fan of shampoo bars- I like the Liggett’s brand, there are countless others and now I have decided that I am going to make some. Chagrin Valley Soap and Craft is an all natural soap company. Their site explains much about the soap making process. The great thing about soap is that there are many small companies spread out through our communities. Here in Litchfield County we have GoatBoy Soaps. You can buy their hand made soaps at many retail stores as well as at the Litchfield Farmer’s Market on Saturdays. I think this is a great idea for a business. T was thinking of starting a gluten-free cupcake company called “Cuppies”. But after eating beaucoup de cupcakes all last winter she seems to have changed her mind. At least she isn’t talking about it much. Well, you can’t eat soap. Whaddaya think, T? we could call it “Shampoo on a Rope”, or “Bar of ‘poo”. Only kidding. 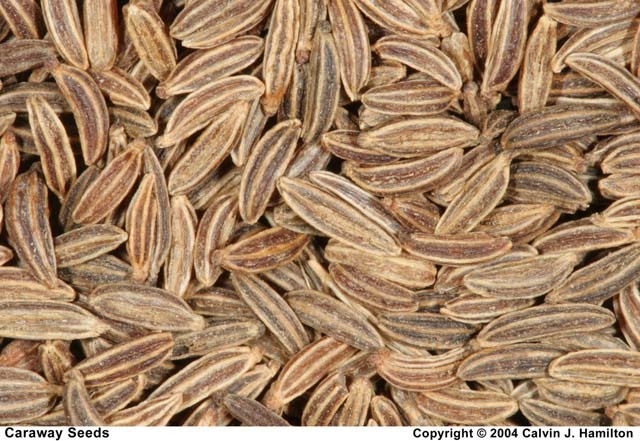 I’m in love with the flavor of caraway seeds. It’s why I love(d) rye bread (avoiding rye due to gluten sensitivity for now). I also love caraway in sauerkraut. Recently I made a soup recipe from The Angelica Home Kitchen, a wonderful organic, vegan cookbook by Leslie McEachern, the owner of Angelica Kitchen Restaurant in NYC. I adapted Leslie’s recipe for Creamy Carrot-Sweet Potato soup- by using onions, carrots and leaving out the sweet potatoes. Her recipe calls for 1 T each of cumin seeds, fennel seeds, caraway seeds and coriander seeds ground to a fine powder. What a concept, I’ve never really used spices in soup seasoning. Just grinding the caraway seeds (in the coffee grinder) releases a glorious uplifting scent and the soup smells heavenly. Now I am sprinkling the leftover powder on everything. It’s fabulous! Caraway is said to have been used in Europe longer than any other condiment. Holland is known as the principle source of commercial caraway although it is also grown in Europe, the United States and Russia today. Each seed is actually one half of the fruit from the plant known botanically as Carum carvi, a member of the parsley family. The seed is common to German, Russian, Indian, Indonesian and Scandinavian cooking. Although caraway has an affinity for cabbage, you can use it in savory or sweet dishes. If you can’t visit Babycakes in SOHO, then you can ask them to deliver or fedex some yummy cupcakes. 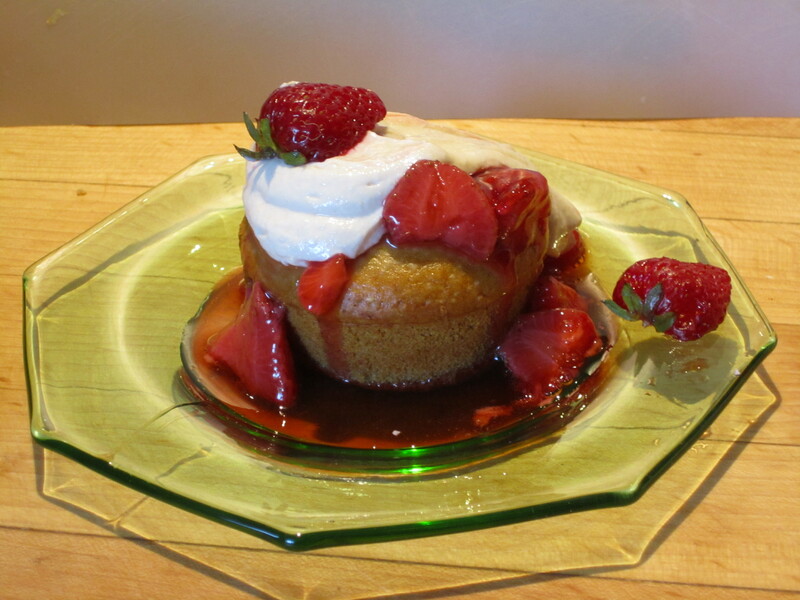 Babycakes bakes gluten-free, dairy-free, egg-free, soy-free and mostly agave-sweetened delectable desserts. Founder and baker Erin McKenna has written a cookbook available from Amazon.com called, yep, you guessed it, Babycakes.